Note to self, blond wig makes your teeth pop even more in a photograph. Audrina was hosting “Hpnotiq’s Halloween Party” and you’ll never guess where it was…Les Deux. I know, crazy right? There was almost a conflict with the hosts as they could get Audrina to host, but at the time Audrina’s teeth were set to host a different party. Luckily, Audrina’s teeth freed up their other commitment and both Audrina and her teeth could make it to the Hpnotiq party. 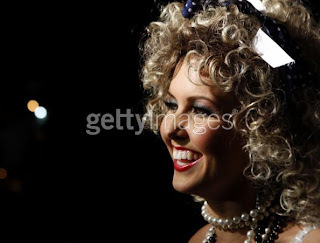 Audrina went as Shirley Temple? Olivia Newton John during the last scene of Grease? Maybe it’s Madonna? I’ll go with Madonna. Original. Without question she should have dressed up as Justin Bobby. Duh. Regardless this was a star studded event with such celebrities in attendance like Christina Milian and Justin Guarini and…well…that’s kind of it. 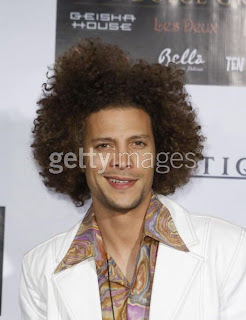 Apparently Justin Guarini went as himself? Is it just me or is anyone else over Halloween already!?! Bring on All Saints Day. Woo-hoo!